I've spent a lot of time writing code to connect up user's contacts across different services, so I've had high hopes of WebFinger, the universal API to connect public profiles with email addresses. To be honest though I worried it might just be a geeky pipe dream that never gained widespread support from ISPs. I'm extremely happy to be proved wrong by Google's release of an implementation for all their public profiles. Interestingly enough Google already had their Social Graph API that exposed a lot of the same information about public profiles, but it never really achieved widespread adoption. I'm really hoping WebFinger will become a much more widespread standard. Maybe it was growing up glued to The Reader's Digest Book of Strange Stories and Amazing Facts, but I've always had a weakness for the odd and neglected corners of history. If you suffer a similar affliction, you'll be as hooked as I am to the Strange Maps blog. Exploring the dark side of geography from the lost Lizardman tunnels of Los Angeles to an atlas of time itself, it manages to take in an asphalt map of Maine and a drive-thru scale replica of the solar system along the way. I just discovered the wonderful floatingsheep.org, home to a whole bunch of new perspectives on the US and the world. My personal favorite is the Beer Belly of America, a map highlighting parts of the country with more bars than grocery stores! I love visiting Wisconsin and can well believe that they have a bar for every 1,700 people. A neon sign in Hayward advertising "Liquor & Live Bait" particularly sticks in my mind. Also highly recommended are Baptists, Bibliophiles and Bibles, User-generated Swine Flu and Allah vs Buddah vs Jesus. I'm so pleased to discover someone else as obsessed with these sort of random but fascinating views of the world. Great work by Matthew, Mark and Taylor! That's Andrew Hyde's new nickname for me after reading the ReadWriteWeb article! More seriously, it's been amazing to see the reaction and support I've received from everyone. I'm so excited by the possibilities and insights we can gain by this sort of analysis, and I'm hopeful that we'll see a lot more of it coming. I'm still trying to catch up with my email and the blog comments, so my apologies for the slowness in responding, but I did want to mention a few things here about the maps. I want to make sure Manfred gets credit for the awesome Mercator Flash component he open-sourced, I used it as the basis for the interactive maps. I've blogged about it before, but he deserves a lot of kudos for making a great visualization building block. If you're interested in the interactive heat maps I use on fanpageanalytics.com, I've also made those available as open-source. I'm feeling very old and out of touch! I was unaware that Stephenie Meyer is from Utah, which explains the Mormon connection. Thanks to everyone who helped educate me, even Edward Cullen himself. Some of you spotted some mis-classification of people's locations, with people from Alexandria, Egypt showing up in Alexandria, LA, and the ex-Soviet Georgians showing up in Dixie. 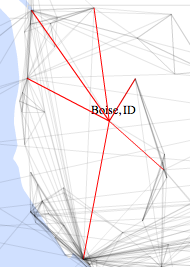 That looks like a bug in the location sorting I'm using, I'll investigate and get a fix in for the next version. I was hoping to get the first release of the academic data set out today, but Facebook have asked for a little more time to check the privacy implications. I'm very keen to avoid inadvertently helping spammers and scammers, so I'm working with them to make sure the data set is useful for network research but not malicious purposes. I'll keep you up to date on how that goes. Max Klein recently posted a how-to on connecting a mailing list of users to their Facebook profiles, giving business owners a deep look into their customer's lives. There's one flaw with his technique, you need to be signed in to a Facebook account before you can get the information. The theoretical drawback here that you've clicked through their terms-of-service which prohibit you from these sorts of shenanigans, and thus taint the data if you wanted to sell it on. The practical problem is that Facebook claims to spot account holders doing these sort of bulk uploads, and blocks their accounts. 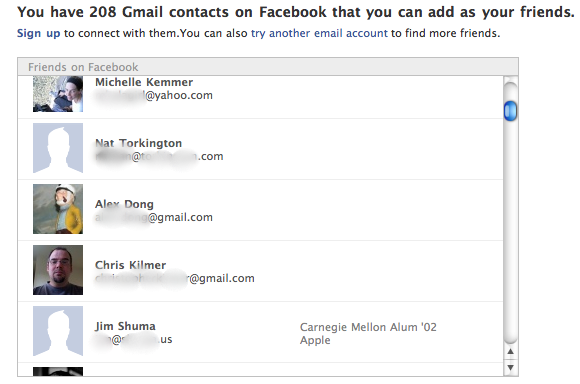 Recently I was surprised to discover that you don't need to be signed in to an account to search by email addresses and match them to profiles. To my mind this is a nasty hole both because it gives companies legal cover to resell the linked data, and in practice makes it tough for Facebook to crack down on firms siphoning off user data. It's a little bit more complex than Max's original approach, so I'll go through the steps below. I've met a brick wall trying to contact Facebook about previous security issues, so I'm hoping this might persuade them to close it.